Hi everyone, and welcome to the sew-along for the first Cashmerette Pattern, the Appleton Dress! 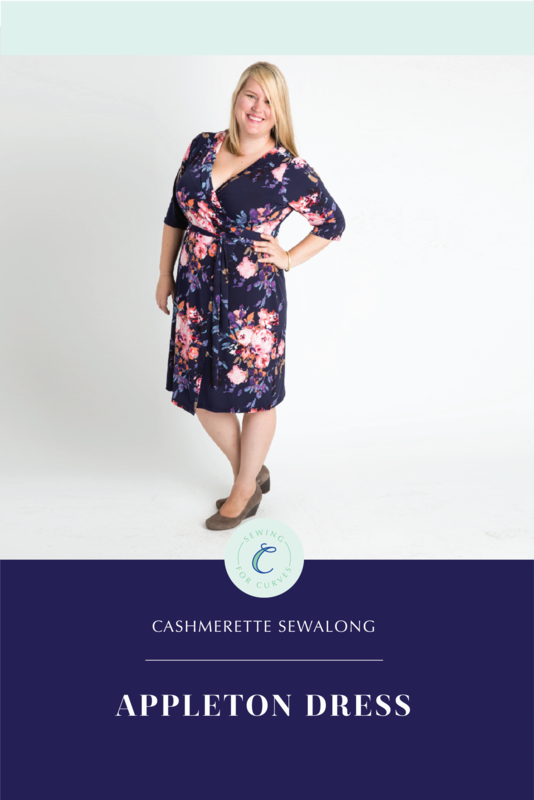 I’m Carrie, a fellow sewing blogger and part of the Cashmerette team. I’ll be walking us through this project and sharing my own Appleton Dress along the way! Over the next few weeks, we’ll be working through this pattern. If your bust is smaller than a C cup (like me! ), I’m going to show you how to make a quick and easy Small Bust Adjustment; it worked well on my dress! This pattern is suitable for advanced beginners (or brave beginners – go you!). Feel free to leave your questions in the comments and we’ll help you through them! Friday 11/13: Appleton Party! Woohoo! After that, you’ll have a new wardrobe staple! Depending on the fabric you choose, this is such an easy dress to dress up for a night out or down for a day in the office. We can’t wait to see what you create! Make sure to share your Appleton Dresses with us by using the hashtag #AppletonDress. After the sew-along, we’ll share a roundup of your creations on Friday 11/13. Not on social media? Send me your makes at carrie@cashmerette.com to have your dress included in the roundup. And exciting news, one of our favorite online sources of jersey, Emma One Sock, has generously offered to provide a prize! Stay tuned for more information on the contest and giveaway. Will you be joining us on the sewalong? Do you have any questions you’d like answered in advance? If you’d like to add the sewalong badge to your blog, you can copy and paste the code below! A shame! I’d love to join the sew along, as I’m definitely a curvy lady, but more a petite curve, so although I’d appreciate your sizing for an F cup, generous waist-to-hip ratio and sway back, I’m just below your lowest size. 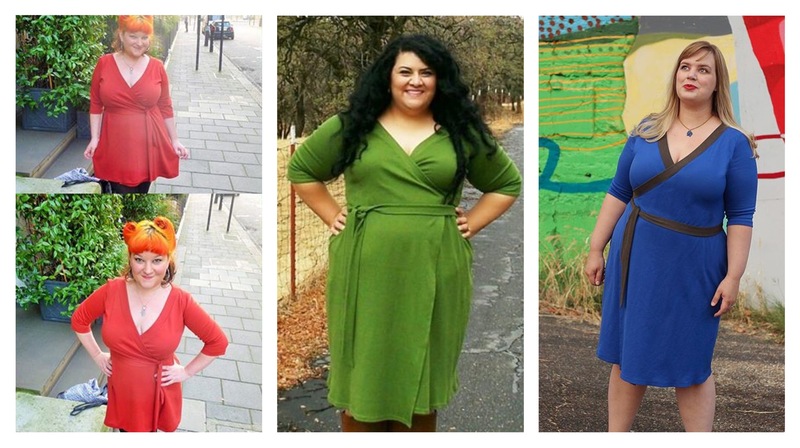 While I completely appreciate that many curvy sewists do want larger sizes, us petite-but-curvy girls miss out on your careful drafting and fabulous design! Do you think it would be feasible to grade down on waist and hip? HI Liz! If you’re only 1 – 2 inches below the 12, I think it should work for you – it may even work without adjustments, because of the way that a wrap dress fits around the body. However, if you’re confident about a bit of pattern adjustments, I would print or trace the size 12, then draw a smooth line connecting the 12 bust down to a line inside the 12 (i.e. the 10! ), which would be about a 0.5 inch along the side seams. You’d need to adjust the front and back, but not the sleeves or any other pieces. Good luck! Thanks, will look again at the finished garment sizes, I may be able to do some playing about! Much appreciated! Wow, I would love to do your sew along, loved reading about your journey with this pattern drafting. Don’t know if your pattern would be any good for me as I am a j cup size so even bigger than you, so know what you mean about wrap dresses. Will sign up and keep watching to see how things go for others. Hi Canne – it really depends on your bust measurement – compare it to the charts, and see if there’s something that would fit your bust that also is in the same rough area as your waist/hip measurement. I’m a HH in the UK which I believe is often a J in the US, and I fit fine into the 18 or 20 G/H. I know exactly how that feels! And don’t worry, we’re working on future wovens right now. Just received mine in the mail and can’t wait to get started! Loved your picture of the first block. Exactly what we need, it fits over the bust but tapers down for the waist andon pulling on the side of the bust!!! It would be great to be able to get a fitted shirt that mirrors your block picture. Some curvy people have waists and not everyone wants to wear a box. Thanks. ‘Tis true. I look boxy if I don’t accentuate my waist! That was definitely the big challenge! And I agree – I *need* waist definition (even if my waist isn’t that small or defined in reality) in order to balance out my figure. I can’t wait for the sew- along. I got some decent knit to muslin- I have a feeling that if it all goes well- it will be wrap dresses, leggings and boots -apalooza come fall! I’ve been looking for the perfect wrap dress! I have trouble with pants (full seat, sway back, too high waisted), button downs (fit in the bust, look like a mumu from the bust down, or fit in the waist, buttons pop around the bust), woven dresses (all the aforementioned problems, plus being 2 sizes bigger on top than bottom). Any good, tailored pants that don’t hit somewhere around my rib cage would be awesome. I like them below the natural waist, just as a personal preference. Tops that don’t fit like maternity wear would be great too. Thanks for your feedback, Jennifer! Yay! I ordered my kit today and I’m excited to sew a long. Working in the swayback and bust sizes is amazing. Thank you. Hoping to figure out how to accommodate my full hips as well. Oh, well done. This has been such a long time coming – thank you. And you’re absolutely right about the wrap style. In my skinny days (I’ll give you a guess how long ago that was), I owned 2 original DVF’s that I wore for more than 20 years, and literally wore them out. I recently made a Vogue wrap that was such a miserable fit, I gave it away. I’m so looking forward to receiving your printed pattern. Best luck to all. What is the final length? I couldn’t find it on the pattern. Or the waist->hem length? Hi Chris! The dress is about 40 inches from back neck to hem (it varies slightly by size). I’m ready for this Jen!! I’ve never found a wrap dress to fit me at both bust and bum without being really clingy or straining somewhere, so I’m very excited about this! I’ll be desperately following the sewalong, but alas one can’t purchase knits here. Can’t wait to get to a country that sells knit fabrics so I can make this pattern! i bought an inexpensive knit from Joann’s to see if i can get the fit right! i’m excited to be participating. So excited to start this sew along; this is my first time trying one! I adore this dress and I just received the pattern today in the mail. I have a pretty ITY knit that I’m a bit nervous to sew with since it seems a bit slippery. It looks shockingly similar to the print on the pattern cover, but in a cream colorway instead. We’ll see! to baste your seams together before sewing – unlike pins, it won’t “fall out” and it washes out after use. I use it all the time! I can’t wait to start. I’m going to trace off the bodice and trim my pattern pieces later today. I’ve already chosen a fabric from my stash. I’ve wanted a wrap dress forever and am hoping I’ll have success with this one! Fun! Just double check to see how much stretch it has – if it’s not 50% then you might need to make some tweaks to the neckband (make it longer) and it may not hug the body quite as much. I made that mistake with a terry t-shirt a while ago! I checked the stretch against the stretch guide and it was good grainwise, but it has much less stretch on the crossgrain does it need 50% there too? The pattern requires 50% crosswise stretch so unfortunately that may not be the ideal fabric. If you still want to go with it, I would size up a bit! Thanks for the heads up. I was a little worried and will look into it some more.